This paper addresses technical approaches potentially useful to bioprospecting in Cuba. 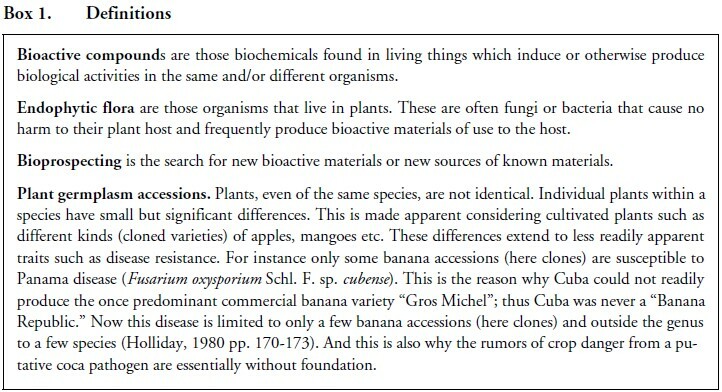 Previously we addressed the matter in a more general way, discussing the reasons why Cuba is a potentially rich source of bioactive materials of plant origin (Daley, 1997). Definitions of some terms used in the paper are given below in a box. The approaches discussed here are intended only for a post-Castro Cuba. Thus it is hoped to avoid the personal and political dangers inherent with working with the present Cuban regime, the unworkable Marxist policies, the micro-management and bungling bureaucracies that have done so much to wreck the Cuban economy, and the doubtful ethical compromises that such a collaboration would entail. The search for bioactive, especially medicinal, plants has occurred over many millennia. Many plants provide effective medicines (Klein, 1979). These medicines include quinine, digitalis, precursor compounds for birth control pills, Taxol® (Wani et al., 1971; Stierle et al. 1993; Hoffman, et al., 1998; Hoffman, 2000), and many others. The historic importance of these bioactive substances should not be underestimated. Quinine for example was essential to the effectiveness of the Mambí armies of Cuban independence. On December 6, 1896, Mambí General Calixto García, writing from La Ensenada between the Cauto River and the city of Bayamo asks for “quinine, much quinine and small pox vaccine because the fever (malaria) and smallpox are causing heavy losses among the Mambí” (free translation from Casasus, 1962, p. 210). There is no doubt that many useful bioactive compounds are found in plants and that many of these remain to be discovered. The difficulty is finding bioactive compounds for specific uses among the vast numbers of species, and even vaster numbers of plant germplasm accessions. This is the process of discovery and this is what we address here. 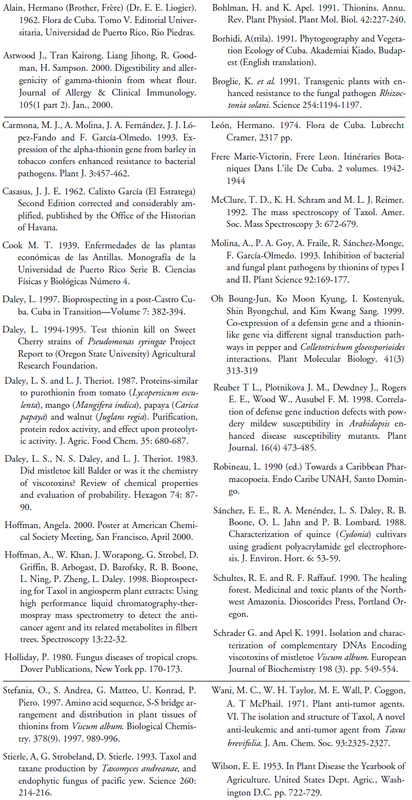 This paper, less general than the previous presentation (Daley, 1997), will discuss in the Cuban context, two specific examples of approaches to bioactive compound discovery: (1) following leads from folk medicine in Cucurbitales using an enzymological approach; and (2) mass spectroscopic screening of crude extracts. One approach is to follow the folk medicine leads with rigorous scientific investigations. This is now a common approach and a good number of sources collate these folk remedies (e.g., Robineau, 1991; Schultes and Raffauf, 1990). Hermano (Brother) León (1974, pp. 154-155) describes a plant loved in my childhood, called in the vernacular as cundeamor. Its scientific name is Momordica charantia L. And it grows on a delicate vine with five or more lobed leaves on chicken wire fences and the like through out the tropics, including Cuba. In times gone by we as children ate the little yellow orange three ridged fruit as we passed by in the hot, dusty, afternoons of Oriente province. The good monk Hermano León describes its properties thus: Los frutos de esta especie y la siguiente (M. balsamina L.) son comestibles, cocidos o curados; la pulpa es dulce y comida por los niños y algunas aves. Las hojas y los frutos se usan como aperitivo, vermicida (my emphasis), y emenagogo; el cocimiento de las hojas se usa contra enfermedades del hígado, la colitis, y los cálculos renales. The cundeamor belongs to the order Cucurbitales, and the family Cucurbitaceae. This is very interesting, since some time ago my laboratory was involved in a project seeking insecticidal, fungicidal, and bactericidal proteins that are harmless to man. We were concentrating research on a group of proteins called thionins (Daley and Theriot. 1987; Daley, Daley and Theriot, 1983). Thionins are a group of fungicidal, insecticidal and bactericidal proteins (e.g., Daley et al., 1983; Daley and Theriot, 1987; Bohlman and Apel, 1991; Reuber T. L., et al., 1998; Oh Boung-Jun et al., 1999). Thionin are small proteins (4-5 kilo-Daltons), and thus coded for by shorter DNA sequences (e.g., Schrader and Apel, 1991; Stefania, O., et al., 1997). Thionins from different plants have different activities against different pests and pathogens, as a consequence of different amino acid sequences and thus are made in each plant species from different DNA sequences. It would seem that every plant species has one or more unique thionins, e.g., wheat which has three distinct ancestors has three distinct thionins. This is an advantage that makes thionins useful for bioengineering. Different thionins have different levels of activity (Daley and Theriot, 1987). ‘Mild mannered’ thionins like those found in corn (maize) do not seem to attack anything. Aggressive thionins like viscotoxins may have been used by cavemen as arrow poisons to kill megafauna (Daley et al., 1983). Thionins are useful for bioengineering plant resistance to pests and pathogens: (a) because since thionins are proteins (Bohlman and Apel, 1991), they can be readily coded into DNA of other organisms (e.g., Broglie et al. 1991; Reuber T. L., et al. 1998). This is more difficult to do with bioactive compounds that are not proteins. 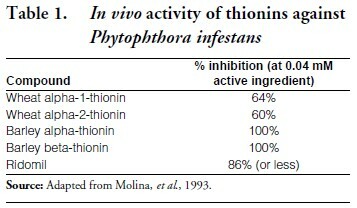 And (b) because thionins attack a wide range of pests and pathogens. Although thionins, including phoratoxin and viscotoxins, can be toxic to insects, bacteria and fungi, many are found in foods we eat such as bread (Bohlman and Apel, 1991). Barley thionin has already been put into tobacco, adding thionin codes to the DNA of this plant, where it inhibits Pseudomonas syringae (Carmona et al, 1993). There is great interest in such proteins that kill or inhibit pathogens that cause plant disease, because proteins can be bioengineered in ways that can protect crops without spraying. Thus thionins can be fungicides, which kill late blight (Phytophthora infestans) on potato leaf tissue more effectively than the chemical fungicide Ridomil (Wilson, 1953; Molina et al., 1993) (See Table 1). The motivation for such research is that now it is practical to move proteins from one plant to another to help improve crop value and crop defense. Thionins are ideal for this purpose and frequently used because their small size facilitates incorporation into the genome of other plants. Regulatory problems are minimized because thionins are already found in such foods as wheat and barley flour (e.g., Astwood et al., 2000). Thionins found in food don’t harm us because they are proteins and we digest them. An effective pest or disease fighting protein moved into and activated in a crop plant can be very useful because the farmer does not have to spray it. The active material is already there, it stays there even if it rains, or even if the fields are too muddy to get the sprayer in. It is there before the insect or the disease reaches the plant. Thus pests and pathogens do not spread readily. We found that there are thionins that when fed (insects have very different digestive processes than humans) can inhibit growth of coleoptera insects (Jeknic and Daley, unpublished). Thus these thionins could be put to such uses as incorporation into cherry rootstocks to inhibit soil invertebrates such as root weevils (Daley, 1994-1995). Since many tree crops have separate and genetically distinct rootstock, it might well be possible to put even the very toxic viscotoxin into rootstocks resistant to root weevil, and where one would not expect that the toxin would reach the upper, crop bearing, part of the tree. Some time ago we found that a thionin (phoratoxin) from American mistletoe was the best to stop beetle larvae from growing. In Europe, a colleague (Zoran Jeknic) once told me, the seeds of Cucurbitaceae are also used to treat intestinal worms. Following this lead, the next year we found a more effective thioninlike protein from a common cucubit (Jeknic et al., unpublished). • virus resistant melons, tobacco, potato, papayas, etc. • senescence resistant carnation, chrysanthemum. Now that practical things can be done with thionins from diverse plants, especially food plants, we can seek them in Cuba. As mentioned above cundeamor (Momordica charantia and M. balsamina) are introduced species in Cuba and thus its germplasm, would be expected to vary less (Sánchez et al., 1988). Consequently one would expect to find very little variation in cundeamor thionins in Cuba. However, a good number of unique native Cucurbitaceae of a number of genera are found throughout Cuba (Alain, 1962; Bromide, 1991). These grow widely and since they are exposed year round to Cuba’s numerous insects, selection pressure for insecticidal thionins can be expected to have achieved results. These plants often grow on abandoned ground, manigua and sao and thus present conditions of agricultural abandonment in Cuba would be expected to favor the spread of these species. Paclitaxel (active ingredient in Taxol®, Bristol Myers Squibb) was once thought found only in yews. However, in our research in Oregon, we found Taxol in hazelnut trees (hazel, Corylus avellana) (Hoffman, et al., 1998; Hoffman 2000). Paclitaxel, one of several Texans commonly found in yew (especially Pacific yew Taxus brevifolia, Wani et al., 1971), is approved to treat ovarian cancers, breast cancers, Copses sarcoma and non-small-cell lung cancer. It is also in clinical trial for treatment of several other cancers (Hoffman, 2000). Complete laboratory synthesis of Paclitaxel is too complex for commercial use. Commercial Taxol is made by derivitizing related compounds from related yews. The presence of such a compound in so distant a genera as (Corylus), which as an Angiosperm is as far from the yew (a Gymnosperm) as perhaps we humans are distant from turtles, suggests that Taxol may be found in many more species than is already known at present. Not only that but Taxol is also found made by the endophytic flora of within the hazel as well as the tree itself (Hoffman, 2000). This places the evolutionary distance between sources of Taxol as far or further than between humans and bacteria. Yet, this is not an unknown situation as the plant “hormone” gibberellin has the same wide distribution between plants and fungi. What this means is that it is logical to find Taxol in widely unrelated plants and endophytic flora. The function of Taxol in plants it not known; however despite the fact that it is also made by fungi, Taxol has some anti-fungal properties (e.g., Hoffman, 2000). Both the yew and the hazel are humid area trees. These theoretical considerations suggest that high levels of Taxol will be found in plants from humid areas. Thus, searches for Taxol producing plants and endophytes should logically start in humid areas of high plant diversity and unique flora. Cuban flora is quite unique (e.g., Daley, 1997) and much of Cuba is humid (see following map taken from Borhidi, 1991). And the phytopathology of the Antilles (Cook, 1939) bears witness to the abundant fungal flora of the area. One advantage of hazel for this use is that such a tree, unlike the yew, is fast growing and not endangered, and its direct product is Taxol. The tropical equivalent of the hazel for this use would be expected to have the same advantages; since growing crops for secondary metabolites is much less expensive and allows greater production than in vitro techniques. An additional factor that favors a new source of Taxol, despite preliminary low yield data, is that traditionally new crop yields increase as data from studies designed to increase the yield come in. Increasing yield is usually done by breeding and cultivation techniques; as in Oregon mint and hop crops, and, in pre-Castro Cuba, sugar. Theories to increase secondary metabolites vary. In our experience Gingko metabolite production increases as fertilizers promote fast growth. However, other metabolites increase in response to stress. An expert, Gary Strobel (personal communication, 2000) suggests that damp conditions, which favor fungal diseases, may enhance Taxol, a known antifungal bioagent, production to fight fungi. Experiments on this matter are underway in my laboratory. Thus it is conceivable, were an appropriate species found, that a tree crop of Taxol in Cuba could bring in income in excess of historic maximal sugar profits. However, a small useful crop would seem more likely. In the incredible progress of the United States, the saying that “G-d is in the details,” is of paramount importance. Such things as the curved handle of the U.S. designed axe, which is said to increase the tree felling efficiency as much as two or more fold, compared to the European straight handled axe, made possible the rapid expansion to the West. In the Cuban context, prior to the present government, much of the island’s wildly successful agriculture depended on tiny details of wisely directed effort, such as wider spacing plantings in the cane fields which allowed ratooning (multiple successive yearly harvests from a single planting). Failure to attend to, and wisely apply, such technical details is a hallmark of the failure of present-day Cuban agriculture. Attention to details is also true in bioprospecting, where economy of effort to achieve results is essential. And thus methods are also of paramount importance. What follows in this “experimental” section is my contribution to this matter. However, it is wise to keep in mind that these methods found here are starting points, not completed technologies and that their application will vary widely with the particular use. One cannot buy thionins; one must prepare them oneself. However, standard biochemical purification methods for thionins, such as chromatography, yield limited amounts of thionins; this limits the amount of materials available for activity testing. To get around this problem we found a better way to prepare thionins. We stopped working with the usual- size scientific equipment and went to industrial sized equipment. For instance, we got a pickup load of mistletoe and, using ultrafiltration filters with about 200 times the through-put of our old lab equipment, we proceeded to prepare gram amounts of phoratoxin. Ground plant material is shaken with methanol, solvent removed under reduced pressure and more water added. The aqueous mixture is extracted with hexane (discarded). The more non-polar components remaining will be removed by solid phase extraction on C-18 Sep-Pak cartridges (Millipore). Components rinsed from the cartridges with methanol are separated by HPLC (reverse-phase column Curosil B, Phenomenex, Hoffman et al., 1998). Mass spectroscopy (same reference) is used to verify HPLC peaks. We came upon this method, and found Taxol in hazel (Hoffman et. 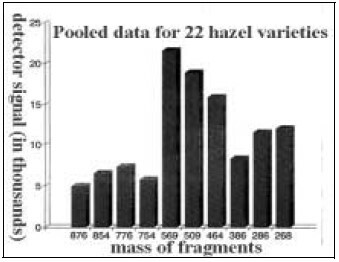 al., 1998, and unpublished), by accident while we were screening hazel accessions (different clones) for biochemical indicators of Eastern Filbert Blight, a disease of that nut-crop tree. Our approach was quite simple: we cut twigs (about 100 g) from each of the accessions tested, placed them in a mason jar in methanol (total volume approximately 0.97 L), and left the sealed jars for two months. Then the jars were opened, the twigs removed, the methanol solution filtered; adding three washes of methanol the pooled methanol was allowed to evaporate. Water (250 ml) was added to residue. Conductivity and pH of solution was measured with hand held devices. Twenty grams of mixed bed resin (HN high capacity Barnstead/Thermolyne, D8901 taken from cartridge) were added to mixture and conductivity and pH re-measured. The pH and the conductivity dropped somewhat, the former from a pH of 3.8 or less to approximately 3.5-2.7, and the conductivity from 6-15 mhos to 4-5 mhos. This aqueous solution was lyophilized (freezedried at low temperature). Yield was about 0.5 to 2 g, depending on variety and sample. The Mass Spectrometer used was a Kratos MS 50 TC (Manchester, England). For these experiments we used a gentle mass spectroscopic method, generally called fast particle bombardment (FAB) when used to examine neutral molecules or less commonly secondary ion mass spectrometry (SIME) when used with charged particles. The bombardment was done with a cesium ion “gun” and the negative ions examined. Samples (0.5 g) were dissolved in 1.5 ml of 2:1 methanol:dimethylformamide. The instrument was set at negative mode, mass/charge range 2100 to 120 at 30 sec per decade. Mass resolution was 2000 (at 2000 mass charge ratio can distinguish between ions differing by one mass charge unit). The metric used was thioglycerol/glycerol 2:1. The figure is a summary identifying mass peaks for one year’s data for 22 hazel varieties.